Oklahoma’s name originates from the Choctaw words okla and humma meaning “red people”. The state’s nickname is “The Sooner State”. Oklahoma’s capitol building is the only capitol in the world with an oil well under. The grounds are referred to as Capitol Site No. 1. 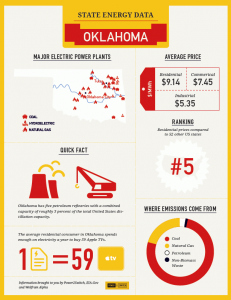 Oklahoma is the next stop in our United States of Energy data series ranking number 5 in residential electricity prices compared to 52 other US states averaging $9.14 Megawatts per hour. Major electric power plants include coal, hydroelectric and natural gas. Oklahoma has five petroleum refineries with a combined capacity of roughly 3 percent of the total United States distillation capacity. Did you know? Oklahoma has the most tornadoes than any other state in the US. The movie “Twister” was filmed in Oklahoma. In Ponca City a tornado once picked up a house with a man and his wife still in it. Though the walls and roof were blown away, the floor remained intact and eventually glided downward, setting the couple safely back on the ground. Do you know any fun facts about Oklahoma? What Does The Jargon On My Comed Bill Mean?